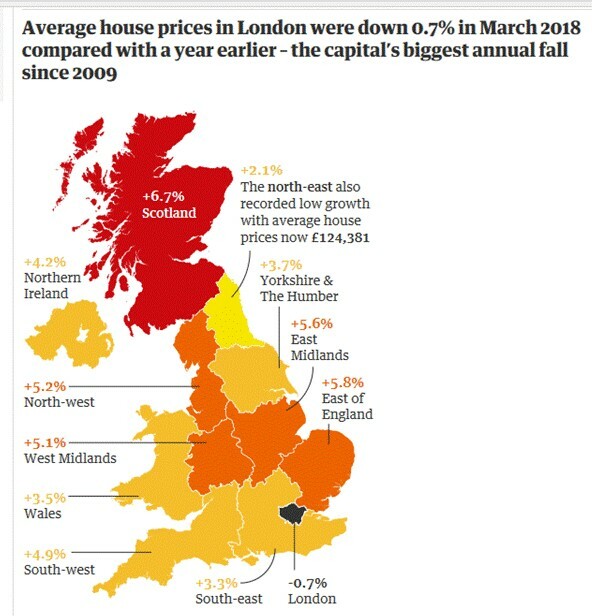 House prices in London tumbled in March, with the annualised rate of inflation dropping to minus 0.7%, the steepest fall since 2009, according to official Land Registry figures for March. The falls in the capital contrast with continued rises across the rest of the UK, with the overall rate of house price inflation at 4.2%, with the highest rise in Scotland at 6.7%. Property experts in London said buyers are “sensing blood in the water”, with sellers forced to cut prices steeply to ensure a sale. The ONS, which compiles the house price index based on Land Registry data, said prices in London have been falling since the EU referendum in June 2016. The ONS said the average price of a home in the UK in March was £224,000, £500 less than the month before but £9,000 higher than in March 2017. It is notable that the 4.2% annualised inflation figure recorded by the ONS is significantly higher than the figures from indices produced by Halifax and Nationwide, which stand at 2.2% and 2.1% respectively. Land Registry data is regarded as “backward looking” as it records actual prices paid and then registered, compared to the indices from the lenders, which try to capture price activity at the point of sale. Separate figures from UK Finance reveal that transaction activity in the capital has declined over the past year. The number of first-time buyers fell by 3% while the number of home movers dropped by 4.3% in the first quarter of 2018, compared with the same period a year earlier. However, Sam Mitchell of estate agency HouseSimple.com said the picture outside London is very different. “For years we have talked about the north-south divide, with house prices in the north struggling to keep pace with booming price growth in the south. But that trend has been turned on its head,” Mitchell said. Economists expect house price inflation to be around 2% in 2018, with some pencilling in only a modest recovery in 2019.